Anuga FoodTec - the international supplier trade fair for the food and drinks industry - will present an up-to-date and comprehensive overview of new technologies, facilities and supplier components for all areas of production from 24 to 27 March, 2015 in Cologne. In the food industry, the packaging of the product plays an increasingly important role in guiding consumers’ purchasing decisions. The development of innovative packaging, as far as shape, attractive graphics and appearance are concerned, has become an indispensable factor in the marketing strategy for large- and small-sized companies that, thanks to versatile and customizable packaging machines, can create an almost infinite range of different packaging solutions. At single-container level, for example, SMI is able to offer its customers the study and design of PET bottles for every specific demand, highly customizable in shape, size, appearance, etc. After careful analysis of customer needs and demands, the idea of the container processed by SMI designers is transformed into a detailed project, complete with three-dimensional rendering, industrial feasibility analysis and simulation of tests on the structural and mechanical strength of the container. SMI vast range of flexible and versatile packaging machines easily integrates product and package each other and addresses in a targeted manner the senses, the sensations, tastes, expectations of each category of consumers, sending them a message of exclusivity and positivity. 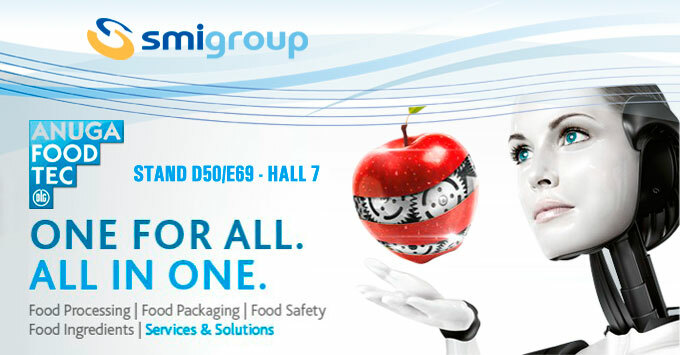 We look forward to meeting you at our stand D050-E069 in Hall 7 and to giving you further information on newer bottling & packaging solutions by SMI.